Just Jingle: Hop To It! Have you seen the latest from Simon Says Stamp?! The Hop To It release is live and it is fabulous! So many cute stamps and dies to choose from! And many have a spring time feel and I was QUITE ready for that here in snow-filled Massachusetts! I used the brand new Artful Flowers stamp set for this card. I LOVE these flowers! They just cry out for watercolors, so that is exactly what I did with them! 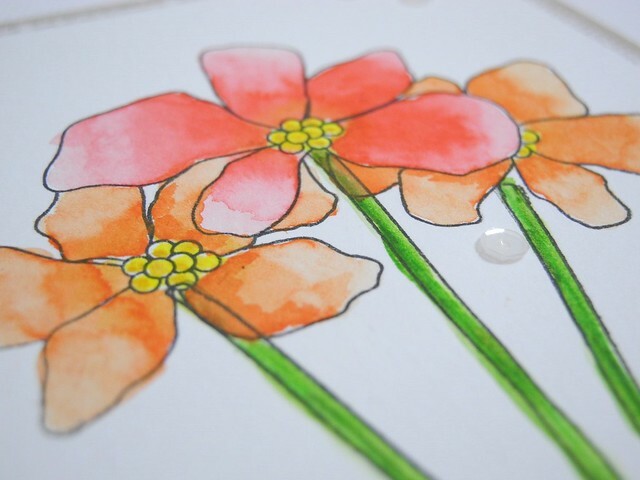 I painted the flowers with watercolors and then used Spectrum Noir Aquas to add some depth of color to the stems. I heat embossed the sentiment in gold on a strip of grey paper, trimmed it into a banner, and adhered it with foam tape. A few simple sequins finish it off! You can find my complete supply list below. Be sure to head on over to the Simon Says Stamp store to check out this release and more! I love this card! From the beautiful colors you chose for the flowers to the text background paper and sequins - it's perfectly lovely! TFS! Such a pretty card! Love how you colored the flowers! Very pretty, love the design and the newspaper print background..the water colored flowers really stand out! This is really pretty! Thanks for sharing.